This room came about when we were doing a VBS a few years back. 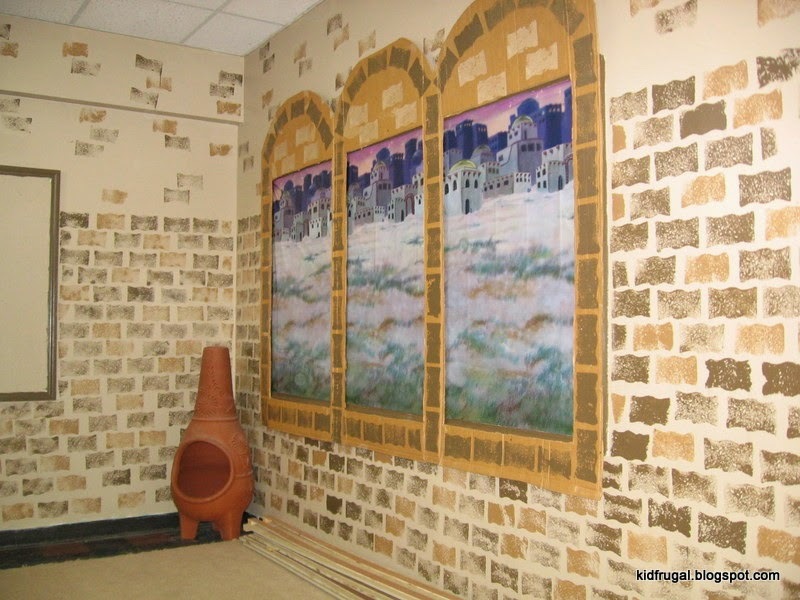 The program had scenery you could project onto the wall of a room to make it look like the inside of a Bible time’s home. I thought we had some rolls of white paper we had made look like stone, and so I planned on doing the whole room instead of just one wall. 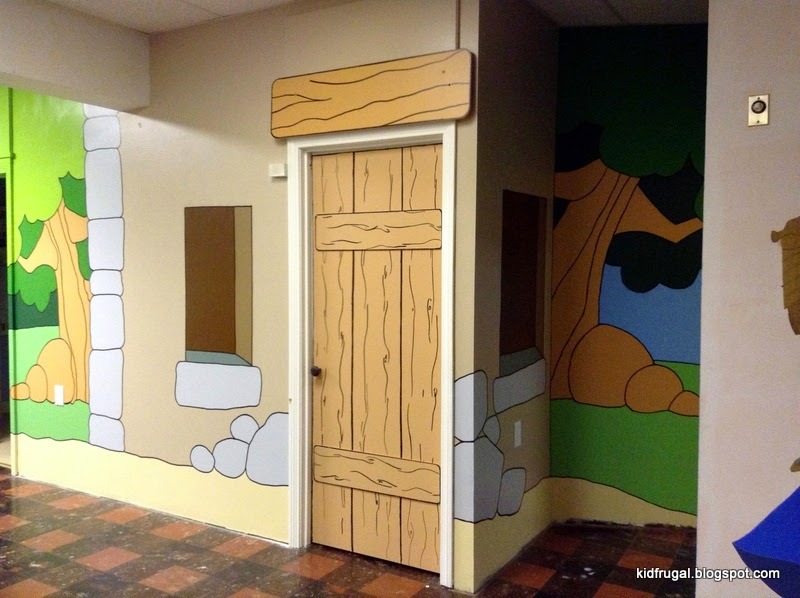 First of all, it took hours just to cover the one wall with paper to draw the scenery on. And, then we couldn’t find those rolls I thought we had. Somehow we decided it would be not be any more work to paint the walls to look like brick instead of using paper. This would give us a themed room we could then use in the future. And so, our Bible time’s themed room was born. 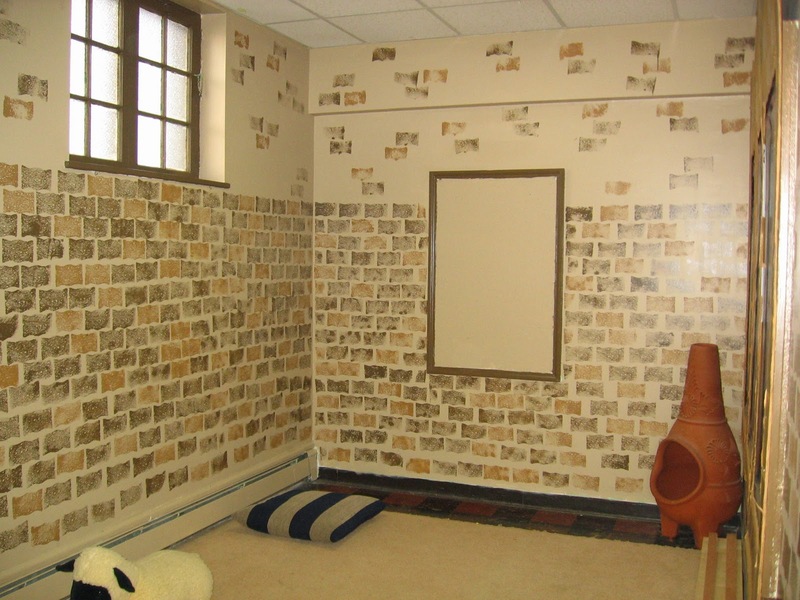 This room won the Decorating Your Classroom on a Budget Contest hosted by Janelle Hoos. You can see the award winning entry here. We painted a solid background color. We used a sponge and two darker colors of paint to add the brick. Adding the brick was time consuming, so we only did solid rows of it halfway up the wall. Then we scattered them above that line. The room had a huge bulletin board that is glued to the wall. These can be taken down, but it is a labor intensive project. Instead, we decided to make a window out of it. We ordered a Christmas Nativity Bethlehem Town Design-A-Room Background from Oriental Trading to make the scene in the window. The window frame was made from a flattened refrigerator box. You could buy some fabric and make large floor cushions like the one pictured here for seating. The giant stuffed lamb was second hand. The chimenea came from a garage sale. This room inspired the theme for the total makeover we did of our large children’s room about three years later. I have written several posts about the makeover.